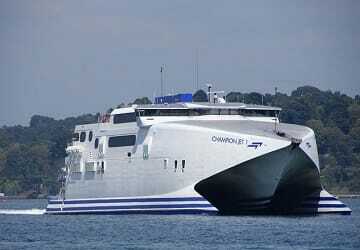 Champion Jet 1 is a fast ferry that was purchased in early 2015 along with its sister ship Champion Jet 2 from Condor ferries, to meet with demand for ferry services around the Greek islands. This catamaran/passenger ferry was built in Australia in 1997 has a passenger capacity of 1000 and can hold up to 200 vehicles in its garages. Onboard you’ll find all the facilities expected of a ship of this class including comfortable seating, café, bar and viewing area. There are no cabins onboard however comfortable, guaranteed, pre-assigned seating is provided on all sailings with a choice of lower or upper deck seating. For passengers of limited mobility, disabled elevators provide access to and from the car decks and easy-to-use internal eleavtors provide access to toilet facilities. Please Note: Whilst we have taken great care in making our Champion Jet 1 guide as accurate as possible, onboard facilities, services and entertainment may vary depending on the date and time of year that you travel, facilities mentioned may change without notification and ferry companies reserve the right to operate vessels other than those mentioned at time of booking without prior notification.